Xamsa was initially founded by Peter Urkedal, a passionate squash player from Norway who currently resides in London, Ontario. In 2014, Peter Urkedal partnered with Tim Burganov, the founder of SportsVirtuoso.com in Montreal, and Xamsa Squash cooperative was established. We neither plan to make profit nor do we have an expensive business structure to support. We have a simple model in mind: By squash players for squash players. All we want is to cover basic operational expenses and pass the savings on to squash players. As such, our prices reflect the minimal cost of bringing products to market. There are many aspects of squash that we want to spend our energy on and we will constantly be in touch with supporters to see what we can do to promote squash on a local level. While we are based in Canada, we would like to expand our efforts to include other countries as well. We want to see squash grow at an international level, and would love to do anything to help such a cause. Being squash players ourselves, we realize how difficult it is to improve your squash skills. While most of us want to improve, very few can afford spending $40-$60 per lesson. 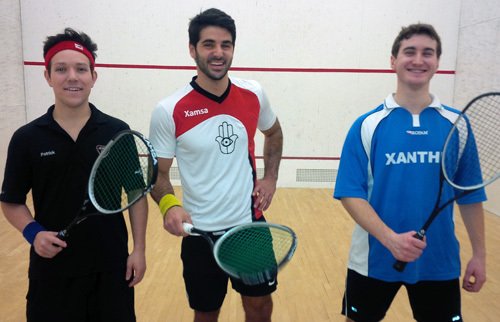 We have been organizing squash camps a few times a year at Club Atwater Montreal at an affordable price. Our goal is to start organizing similar squash camps in other Canadian cities and we will be happy to assist our dealers and distributors around the world as well. Please don’t hesitate to contact any of us directly if you have any questions or suggestions. We hope you will be a partner of Xamsa Squash in any possible way! Enter your email to receive news and special offers. Everyone who gives Xamsa racket a try is a Xamsa supporter. That means a lot to us even if you are not 100 % happy with the racket. You can leave a review of the racket on a product detail page but if you have a photo with you holding Xamsa racket, please email to tim@xamsa.com along with your review, your name, squash club, City and the country, and we will be happy to add it to Xamsa Supporters section. Thanks a lot.